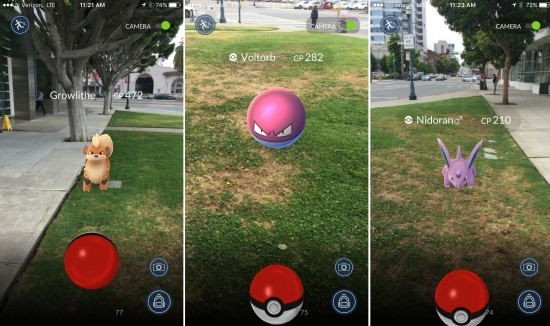 Have you started playing the new Pokemon Go game? Well, it's been downloaded over 7.5 million times in the past week. But this isn't the same type of app or game that has you just stuck inside wasting time on. You have to actually get outside and wander around the real neighborhood to capture those digital monsters. It's call augmented reality. If you aren't playing you may have noticed an uptick of people with their faces in their phones around certain landmarks or holding their phones up and flicking. While it's great that people may be getting exercise as a side effect and may even run into other real players while outside, authorities are warning users of some potential dangers. 1) Always look where you are walking, don't stray into traffic, don't walk into something, and don't somewhere you are not allowed (no trespassing). 2) Beware of your surroundings. Some people have been lured to locations on the map by virtual placement of 'pokegyms' or 'pokestops' only to be robbed in the real world. 3) Don't go anywhere you wouldn't go in the real world, like a bad neighborhood or dark alley. It would all seem like like commonsense, but since these have already been broken, it could use a reminder. A 35-year-old man was killed in a boating accident in Barnegat Bay in Ocean County on Sunday. A 36-foot speedboat and a 16-foot Carolina skiff collided in the Barnegat Inlet off the coast of Long Beach Island. Three people were thrown into the water. The U.S. Coast Guard responded quickly and retrieved them. Chanhee Kang of Hainesport, New Jersey, was pronounced dead at the scene. A second person was taken to the hospital with minor injuries. The investigation is still ongoing. Kang was driving the 16-foot boat. A former Philadelphia school principal was sentenced to 10 years of probation and ordered to 100 hours of community service today after pleading guilty in February to perjury, tampering with public records and conspiracy in connection to a standardized test cheating scandal. 61-year-old Evelyn Cortez was the principal of Cayuga Elementary School. She was arrested along with four other teachers by the Office of the Attorney General. She was accused of changing students' test answers and providing students answers to PSSA tests. She'll have to do 100 service hours related to teaching literacy and also have her teaching license revoked.